The Reverend James Buckley was ordained a Wesleyan Minister in 1791 and was appointed to the Glamorganshire Circuit, which in those days Stretched from Chepstow to Llanelli. This Public House is named after him because of an incident which occurred on his first visit to Llanelli. Near the end of his journey he had to cross a small arm of the sea which was fordable at low water. A person that he saw there told him he might cross with safety and directed him to keep a certain object steadily in view. Mr Buckley had proceeded many yards, when the water became so deep & the current so strong, that he was carried downwards over a quarter of a mile, before he reached the other side; and then he only found soft mud, insufficient to bear his weight. Happily, a person who was perfectly acquainted with the area saw him, called upon him to stand still, and then hastened to him and guided him out of his difficult and most perilous position. Completely wet and covered in sand and mud, he got over the remaining four miles of his journey as quickly as possible, and rejoiced to find himself under the hospitable roof of Mr Child. Mr Child had already founded a brewery in Llanelli: and the Reverend James Buckley married his daughter and in later years ran & owned the brewery which bears his name today. 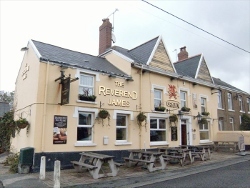 The Cardiff brewer Brains that now own the brewery now market a beer nationally that is called the Reverend James, so you can get a pint of the Reverend.